On November 11, 1918, World War I ended after four exhausting years of destruction and unimaginable horrors. But even in the worst of times, humanity's innate decency can shine through the darkness on occasion. During the first year of the war, Christmas morning was marked by an official cease-fire on both sides. On the front lines troops from both sides of the conflict crossed No Man's Land to celebrate the holiday with their erstwhile enemies. Carols were sung, gifts were exchanged and a spontaneous game of soccer kicked off. 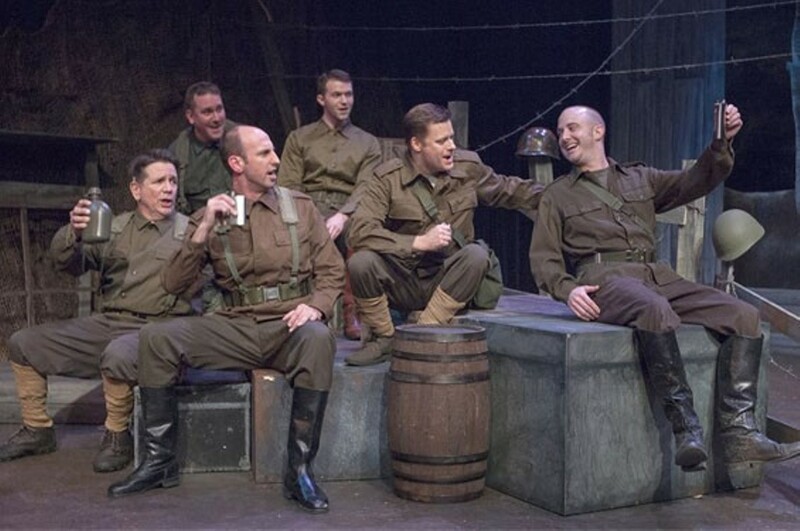 All Is Calm, the Peter Rothstein, Erick Lichte and Timothy C. Takach a cappella musical about that quiet morning when brotherhood won out, has been a favorite with Mustard Seed Theatre audiences since the company first presented it in 2014. It's back again at Mustard Seed to mark the centenary of the last day of the War to End All Wars. Performances are at 8 p.m. Thursday through Saturday and 2 and 5 p.m. Sunday (November 16 to December 16; no show on Thursday, November 22) at the Fontbonne Fine Arts Theatre (6800 Wydown Boulevard; www.mustardseedtheatre.com). Tickets are $15 to $35.